The DeskRite 300 Electric Height Adjustable Sit-Stand Base from Posturite provides users with the option of regularly changing their work posture throughout the day. With an adjustable height ranging from 27.6" to 45.25", the DeskRite 300 offers an extensive range of users the freedom to easily transition between sitting, leaning or standing positions. Note: It is important to add the thickness of the table top to the frame height to determine the final working height. 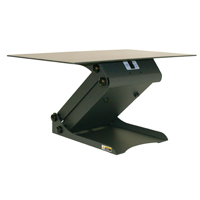 The DeskRite 300 frame is adjustable in width from 41.3" to 68.9" and can accommodate tops from 23" to 30" in depth. 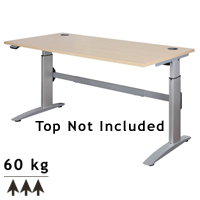 A simple two-button control lets users raise or lower the desk at 0.6" per second and the 132 pound lift capacity is sufficient for most applications. The DeskRite 300 is built from easily-recyclable aluminum and is equipped with a motor which can be replaced with minimal disruption to the workspace should there be a need. In spite of the light weight of the aluminum frame the DeskRite offers rigidity and stability comparable to many other common steel sit-stand frames which possess greater mass. The DeskRite is a perfect way to repurpose an existing desktop to create a custom sit-stand workstation. 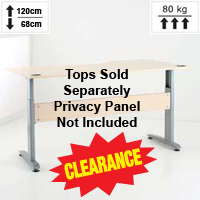 If you do not have access to an existing top you may wish to consider one of these Table Top options. The ELECTRA Electric Height Adjustable Desk Base from iMovR is an advanced, versatile and elegant electric height-adjustable frame with an infinite width-adjustment range between 44" and 75" for tabletops ranging from 48" to 83" wide. Dual synchronized ultra quiet (under 42 dB) TiMotion motors, one housed in each leg, provide a travel speed of 1.7" per second with a lift capacity of 180 lbs. Height adjustment ranges from 25" to an impressive 51", including the 3/4" tabletop (not included but sold separately). 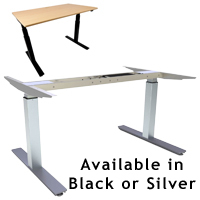 The ELECTRA desk base comes in both black and silver models. For users with height adjustable desks on wheels ConSet provides the Rechargeable Battery Kit Accessory for cordless convenience . 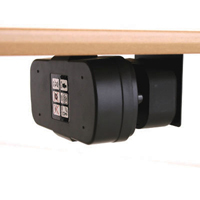 The package includes a rechargeable battery, battery charger, and under-desk battery mount. When used in a conventional office setting the battery will only need to be charged for approximately 2 hours every 2-4 weeks. 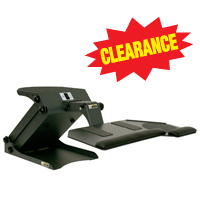 Additional batteries and under-desk battery mounts can be purchased for powering additional desks. This battery can be used with the following desks: 501-7, 501-17, 501-19, 501-25, 501-27, 501-29, 501-32. The 501-19 Series from Conset is the perfect balance of form and function for a single column electric workstation. It is ideal for small, podium-style applications (not corner applications) where mobility is a potential requirement. The top frame will accommodate smaller, rectangular tabletops. The motor has a total lift capacity of 220 lbs. The adjustment range is 26" to 46.5" at a rate of 1.1" per second. This base will support most smaller custom worksurfaces and several stock tabletops. It is designed with stability and comfort in mind, offering more floorspace for the feet of the user than the 501-7. If mobility is a requirement, an optional caster accessory and battery pack (for uninterrupted power supply) is available. Available in powder coated silver or black. The Winston-E Workstation Dual from Innovative is a motorized height-adjustable sit-stand add-on unit that converts almost any sit-only desk into a sit-stand desk. This all-in-one unit will raise a keyboard, mouse, or other desk accessories, including two monitors, to whatever standing height required (up to 18.4" above desk height for the keyboard platform; up to 37.6" above desk height to the middle of the monitor). The Winston-E has one-touch power buttons for easily moving the unit up or down, including the ability to program the height-adjustment range so that the same standing height is always achieved. The keyboard platform (30" W x 18" D) and monitor mount (100 x 100 mm VESA compatible) move as one unit for height adjustment*. The monitor mounts also permit focal depth adjustment to ensure that monitors are appropriately positioned. 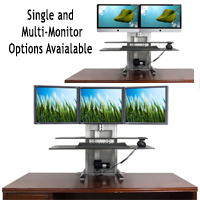 These multiple adjustment mechanisms allow for the best ergonomic positioning of monitors. The keyboard platform for the Standard unit is 30" wide by 20.4" deep, while for the Compact unit is 30" wide by 14.4" deep. All versions of the Winston-E include a heavy metal base to stabilize the unit so that it can be positioned anywhere on the desk surface without having to clamp or bolt it to the desk. Single and Triple units are also available. Call for details. 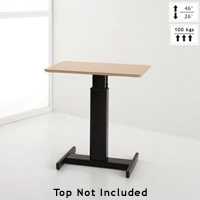 The One Touch Ultra for PC or iMac from ErgoTech Group is an electric motorized desk add-on unit for creating a sit-stand workspace using an existing desk. The Ultra has two worksurface areas: one upper surface for placing documents or other desk objects and one lower surface for keyboard and mouse. Different monitor mounting kits can then be added to mount monitors using a VESA plate mechanism. The Ultra holds up to four 27" monitors at once (with a combined weight capacity up to 100 lbs) and has a height adjustable range of 20". By default the basic unit comes with a desk clamp mount, but grommet, rail, or wall mounts are also available at extra cost. In addition, laptop mounting hardware is available as an option using the same mechanism within the monitor mounting system. The One Touch Ultra comes with a base unit (including electric motor, a center monitor mounting pole, upper 13"x36" and lower surface [13"x36" or 17"x36"] worksurfaces) and a desk clamp mount. 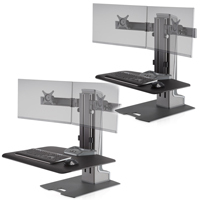 Monitor Mounting Kits are purchased in addition to the base unit and desk clamp. Which kit to choose depends on how many monitors you wish to use.